Today is Heart Day, or Valentine’s Day. It is the day where you make a formal declaration of affection to friends and family. Always a fun day, it conjures up long ago memories of making handmade Valentine cards for classmates, family and friends. Sometimes my Mom would get each of us a box of those small cards and envelopes and we would sort through them trying to decide which one to give each classmate, wanting to make sure it was the perfect one for them. Most of the time though we made our Valentine cards and my Mom always gave us the most fun materials to make them with. She would pile aluminum foil, crayons, paper doilies (I can still hear my brother going eeewwww! ), construction paper, colored tissue paper, Sunday comics, glitter (my favorite)pens and pencils. We were proud of what we made, and especially looked forward to giving the biggest and gaudiest to our teacher who invariably said it was the most beautiful Valentine she had ever received! We strutted around the rest of the day with our chest pushed out and our heads held a little higher. There were usually cupcakes and cookies , heart and red hot candies to eat at school and home. As we grew to adulthood, those customs changed, and although we might occasionally send Valentines to old and dear friends, sweet sentiments were now pretty much reserved for immediate family, especially our kids and spouse. It still would occasionally include a homemade gift and this year was just such a year. I decided to reframe a pastel chalk portrait for Keith. It happened to be a portrait of Keith himself with of all things, a rabbit. He was a young adult when it was done, and the rabbit was a very large rabbit, an equally sized presence in this artwork. Seems a bit odd, except that the portrait was done when Keith, long ago, was the star in a production of what was once a famous Broadway play, and then a movie, that many will remember, called Harvey. The portrait was a prop, and was based on the one hung on the wall in the movie starring Jimmy Stewart. After the play, Keith was given his portrait, which was hung for a while in his bachelor pads and then eventually stored. I thought he might enjoy a happy memory from his past. The mat around it had severely faded, although the portrait had not, and the frame was pretty beat up and did absolutely nothing to enhance it. So for heart day I thought I would reframe it for him to once again enjoy, as it is the kind of piece that you cannot pass without smiling, especially if you know Keith. When I took it to the framer, we put it on the counter and removed the backing, and when we pulled it away from the frame, there was another large blue sheet of heavy paper behind and covering the back of the actual portrait. I lifted off this in-between blue sheet, stopping before I got to the portrait.. After turning this blue sheet over, the framer looked at me as I gasped. I could also feel the goosebumps raise up on my arms, and quietly sighed a surprising “OMG”.. The framer thought it was the original, but I knew it wasn’t. When I told him, and then lifted the original, which had deep, rich jewel tones, out of the frame and turned it over, he repeated an “OMG this is weird”. 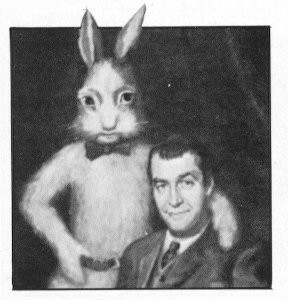 At that moment I am sure he thought a giant rabbit (a pooka in the movie) must surely be looking over his shoulder or mine, and as he looked at me, somewhat paler now. 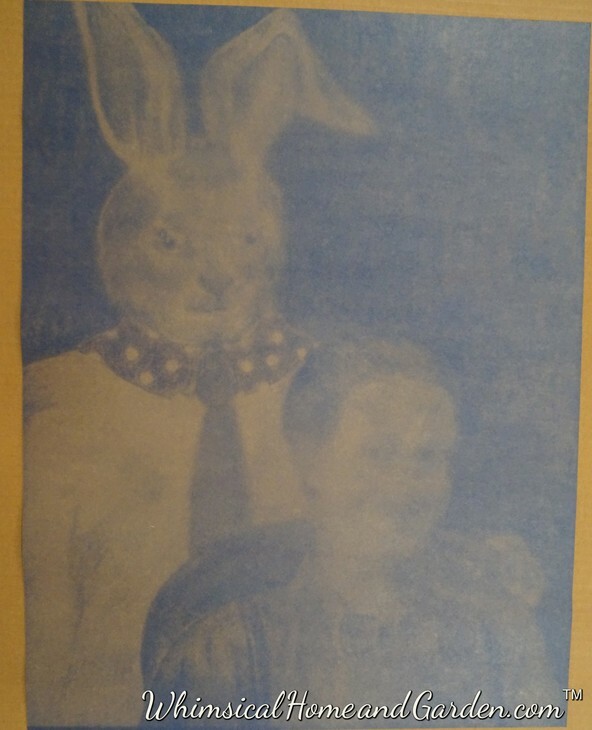 None of the other framers, after hearing our OMG’s and coming closer to see what all the commotion was about, could offer an explanation as to how the original portrait was outlined on this paper in a very ghostly blue and white way, especially with the original having not faded one bit. How did this happen? 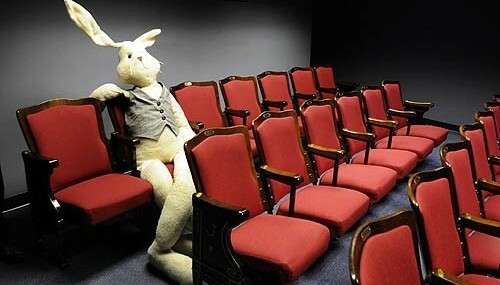 In the movie and play, “Harvey, was a POOKA, a friendly, but a ghost like friend. POOKA- from old Celtic mythology -a fairy spirit in animal form – always very large. The pooka appears here and there – now and then – to this one and that one – a benign but mischievous creature”………Keep that description, a direct quote from the movie, in mind. We played around with mats and a few frame options, both shifting our eyes around more than normal in an uncomfortable way that says,”hmmmmm, can’t get that Ghost print out of my minds eye”, until I finally said to him, “you know, I think I need to revisit using just a simple black frame and probably without a mat. I do believe he was clearly relieved to end this particular framing project. I found and selected a perfectly sized black frame already in stock from an aisle way , purchased it and left the store, sure that there was something a trifle bit odd, and as yet unexplainable. I arrived home to see how I could personalize this portrait for Keith. I made a miniature marquee sign to place on the bottom with a couple of smaller photos of Keith. Marquee addition added to portrait. 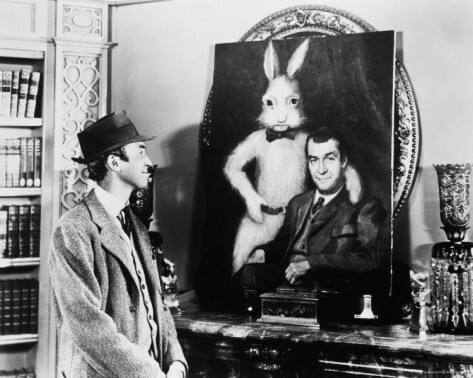 I found a black and white photo online of Jimmy Stewart looking at his portrait of Harvey in the original movie, printed it and placed it on the upper right corner of Keith’s portrait. I was still at odds as to the second blue ” ghost” portrait and whether I should purchase another frame and hang it along side the quite colorful original. For now I decided to put it back behind the original in the new frame, then show it to Keith and see if he had an explanation that made sense. 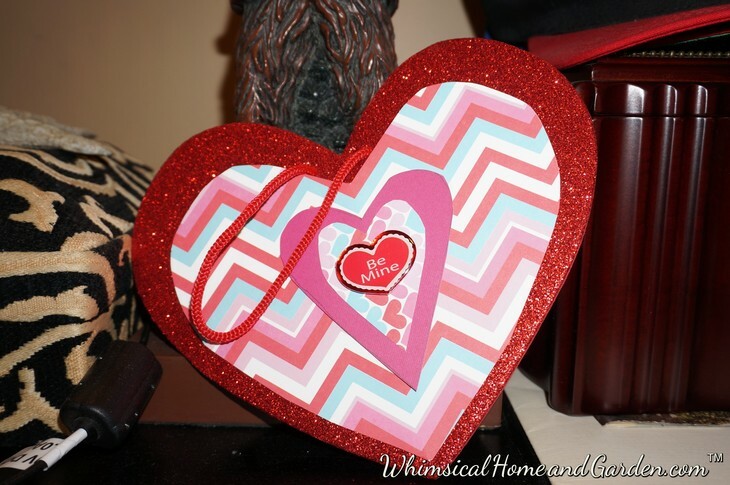 I then made a fancy heart, with lots of red glitter of course, and embellished it with a few patterned and layered hearts, added a fabric cord and placed it on the top of his dresser. I put the newly framed portrait in the dressing room, where it will hang above his tall, narrow, matching black dresser. It was temporarily leaning against the wall where it will hang, covering a framed photograph still hanging that I hadn’t taken down yet, but was ready to do so. After coffee this morning, I suggested he go to our dressing room to find his prezzy. He went into the room, looked and turning around, his gaze went right past the new portrait. He then picked up the heart, looked at it somewhat puzzled, and said “ahhhh”, and then looking around again, still didn’t see it! I told him to keep looking and then it finally caught his gaze! After looking at it, he got a bit emotional, thanking me with one of his giant hugs. He said to me “thank you, because the framed portrait not only holds memories for me, but thank you also, because of where you chose to hang it”. 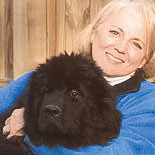 You see, that space was previously occupied by a large framed photograph of my late husband and me with one of our favorite dogs. I had gotten so used to it being there that I never took it down after Keith and I became a couple, and being the sort of person he is, he never asked that I do so. It was only when working on another dressing room project that I decided that it was ok to place it somewhere else, as my wonderful memories of Phillip are mostly all in my heart now. You see, when a person dies, you do not stop loving them. So even when you fall in love again, you do not forget what came before, but realize that eventually the love changes form and moves to a different home in your bank of memories, into your heart, and that taking down that photograph down was ok. So all this brings me back to the “ghost” portrait. 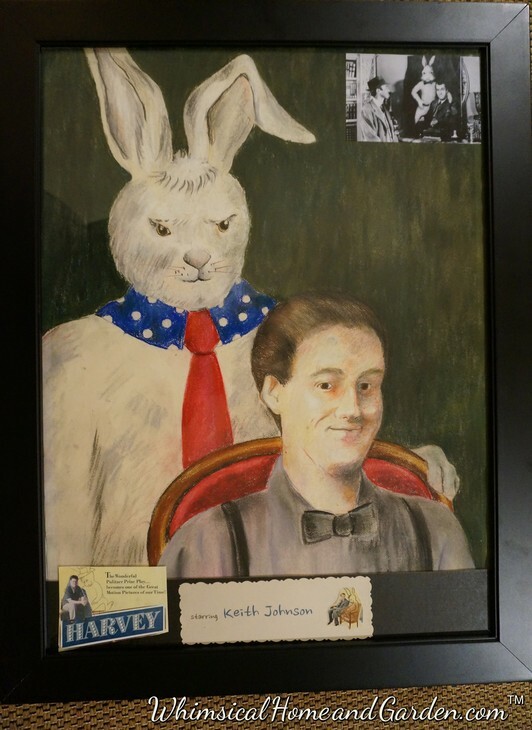 I took down the newly framed portrait Keith had just received that was leaning on the dresser, removed the back, pulling out this ghost like portrait of a rabbit pooka, now showing it to Keith. He seemed as surprised as I was to see it. He had no idea how it was created and had never seen it before now, but thought it odd that it would fade and not the original, which had not been been sprayed with fixative until I did it for this reframing project. It leaves the mystery unsolved, but maybe not. Perhaps the ghost portrait was provided courtesy of another pooka, perhaps from my past, and into a bit of mischief, and with a message, reminding me to be happy and that moving forward is a good thing, and that there is always a bit of mystery in life, and that whimsy is a good thing………..